Poor indoor air quality is caused by the constant use of harmful chemicals and other materials to make our indoors look neat and smelling good. However, we hardly realize this makes the air quality 10 times worse than the outdoor air. Let us all be honest for an instance – the ozone layer is constantly hitting the impact of the rising air pollution. We obviously have prime sources of outdoor air pollution such as industrial smoke, transport emission, etc. are to be blamed. It is completely safe to say living indoors seems to be a great idea than inhaling polluted air outside. Having said this how safe is your indoor air quality? It has been scientifically proven that in-house air quality causes common health issues that can have a long-lasting impact on our lives. Smoking tobacco, building material, furniture varnishing, cleaning and hygienic products, air fresheners, cooking smell, and other indoor activities are some major reasons behind indoor air pollution. 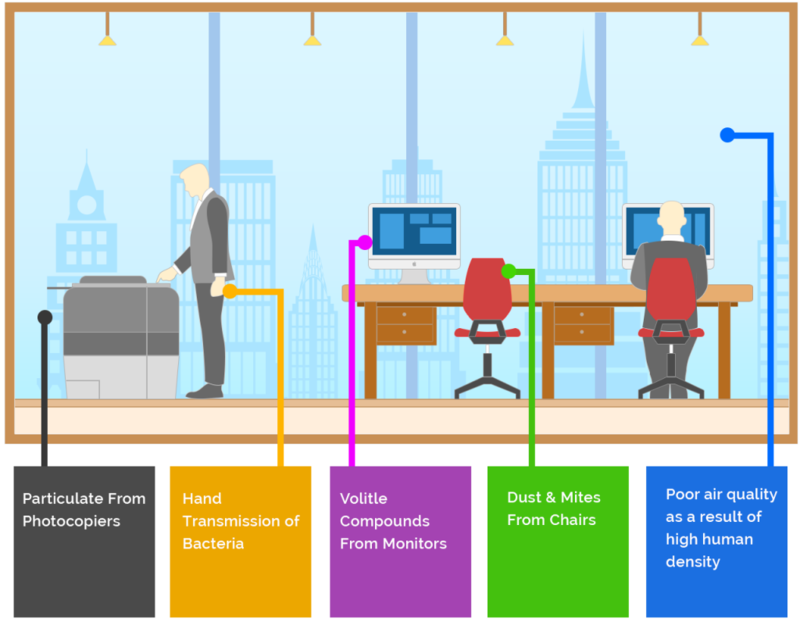 On average, a working person spends 8-9 hours of his/her time in the office environment inhaling indoor air particles that can cause a number of health issues. One of the best ways to combat poor indoor air quality is to install air purifier which has HEPA filters in them. This way not only you curb indoor air pollution but also are able to breathe fresh, clean air. Air purifiers not only clean the air but also gets rid of the unpleasant smell. It traps any pet dander such as germs or hair particles and body odor. Besides trapping the airborne particles, a good air purifier circulates clean air in the room, removing almost 99.99% pollutants. Air purifier works best for the surroundings where inmates are often complaining of common health issues. HEPA air purifiers capture and neutralize airborne particles from polluting indoor living environment. Clean your floors regularly by using a cloth mop. Keep your indoors well lit and ventilated. Make your indoors a no smoking zone. Keep a check on the radon and have a pest controller visit on a regular basis. Use natural fragrance and eliminate synthetic products. Here is a short video showing the importance of air purifiers in every room of your indoors. To shop best air purifier online, visit www.pranaair.com.